The Mound City National Cemetery, located just outside of Mound City, Illinois, is one of the oldest national cemeteries in the country. Unique features of the cemetery include a monument to the Union soldiers of Illinois dating to 1874, and the grave of Russian-born Union Brigadier General John Turchin. The cemetery is also the site of a superintendent’s lodge designed in 1880 by U.S. Army Quartermaster General Montgomery Meigs. Although the Mound City area never saw combat during the Civil War, its strategic location near the junction of the Mississippi, Ohio, and Cumberland Rivers made the city an important naval facility for the Union. The repair facility for the Mississippi Squadron—a fleet of 80 vessels—was located here. Three of these vessels—the ironclad gunboats USS Cairo, USS Cincinnati, and the USS Mound City—were built in Mound City. The city's location also made it an ideal place for a major hospital complex. A hotel and foundry were converted into hospital buildings which could serve 1,000 to 1,500 men, making it one of the largest medical complexes in the West. The wounded were often brought to the city by the Red Rover, a side-wheeled steamer that served as a floating hospital and ambulance between Mound City and Memphis, Tennessee. The high number of casualties at the hospitals created the need for a cemetery in southern Illinois. 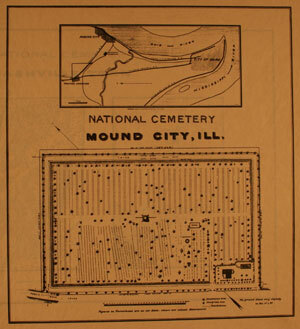 In 1864, Mound City National Cemetery opened to inter the dead from the hospitals at Mound City and Cairo, Illinois, six miles to the south. 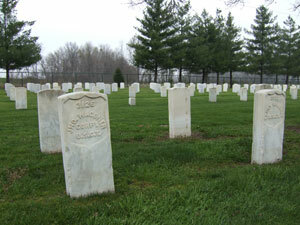 The Mound City National Cemetery is located on a small, rectangular lot one mile outside of town. Owing to its low elevation, levees originally surrounded the cemetery, though today only one levee remains along the southwest side of the property. The main entrance sits at the southwest corner of the cemetery, marked by stone piers supporting large iron gates; smaller pedestrian gates flank both sides. From this entrance, a wide, central pathway running to the northeast extends into the middle of the cemetery and then takes an abrupt left turn. The cemetery was expanded in 2007 with ten new sections added to the northwest of the historic cemetery; a separate road extends into this area, ending in a roundabout. 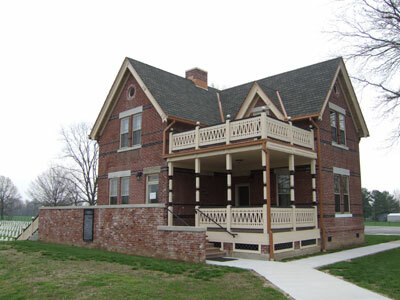 The most significant building on site, the superintendent’s lodge, dates to 1880. Designed by Quartermaster General Montgomery C. Meigs, the lodge features a Victorian design with pronounced gables and highly decorative trimwork. While this style is common for the time, it is unusual for Meigs; the majority of lodges built by Meigs were designed in the Second Empire style with a distinctive mansard roof. The lodge was modified slightly in the early 1930s when the porch was enclosed; a utility wing was added in 1935. Other structures on site include a 1931 utility building, a flagpole northeast of the main entrance from the same year, a 1939 rectangular rostrum with brick columns and a hipped roof, and a committal shelter located northwest of the entrance. Like all early national cemeteries, the first graves were marked with simple wooden headboards or numbered stakes, which were replaced by upright marble headstones. The Mound City National Cemetery is the final resting place for 8,262 soldiers, including 2,759 unknown soldiers, and 27 Confederate soldiers who died in nearby hospitals. Also buried here is Union Brigadier General John Turchin, who immigrated to the United States from his native Russia in 1856 and joined the 19th Illinois Volunteers in 1861. In 1862, then Colonel Turchin was court-martialed after his troops looted Athens, Alabama; he was later reinstated and promoted by President Lincoln. Turchin and his wife are buried side-by-side in Section F, Gravesite 5008B and 5008C. 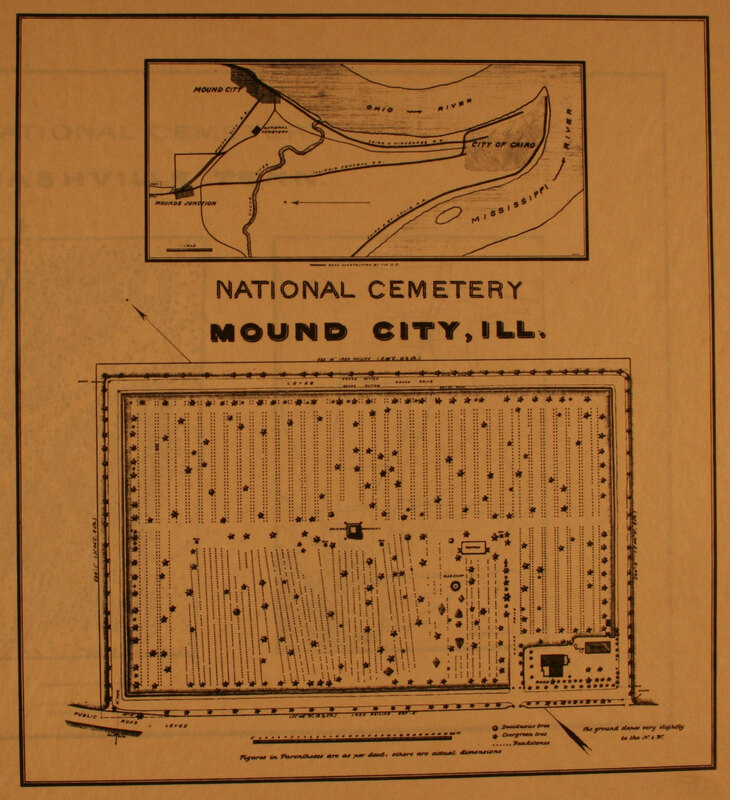 1893 Site Plan of Mound City National Cemetery. Also on site is an artillery monument composed of a cast-iron seacoast artillery gun tube set upright on a concrete base. Originally, four such monuments were located at the cemetery, though today only one remains. Two sets of cast-iron plaques dating from the 1880s are also prominently displayed at the cemetery. Two plaques located near the entrance feature sections from the 1867 Act to Protect and Establish National Cemeteries and the 1875 General Orders No. 80 of the War Department, which details the rules and regulations for the national cemeteries. Along the path from the main entrance to the rostrum are seven other cast-iron plaques, each with a stanza from Theodore O’Hara’s poem “Bivouac of the Dead.” Also on site is a large cast-iron sign with the text of the Gettysburg Address. All were installed in the late 19th and early 20th centuries. Mound City National Cemetery is located at the northwest corner of the junctions of Old Highway 51 and Walnut St. (Illinois State Route 37), one mile west of Mound City,IL. The cemetery is open for visitation daily from dawn until dusk. The office is open Monday-Friday from 8:00am to 4:30pm, and is closed on New Year’s Day, Thanksgiving, and Christmas. For more information, please see the Department of Veterans Affairs website. While visiting, please be mindful that our national cemeteries are hallowed ground. Be respectful to all of our nation’s fallen soldiers and their families. Additional cemetery policies may be posted on site. Mound City National Cemetery was photographed to the standards established by the National Park Service’s Historic American Landscapes Survey.